This is a special make up mask to benefit breast cancer. It's the same as the regular Cashel Crusader, but with a touch of pink. A portion of the proceeds is donated to the Breast Cancer Foundation. Unique design that keeps the mesh well away from the eye area, the Crusader fly mask is the most comfortable mask available. The plastic coated mesh is durable and blocks 70% of damaging UV rays. 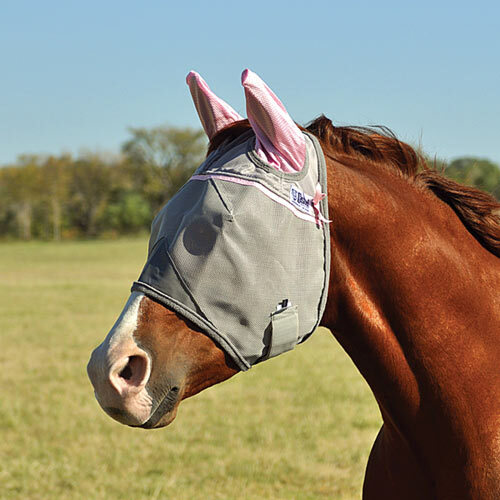 Made from soft nylon micro mesh, the ears keep biting gnats from torturing your horse. Gray mesh with gray trim and pink mesh ears and accents. together. Machine wash, line dry.